The voltage rating of your light bulb needs to match the voltage of the power supply it’s being plugged into. A bulb with voltage that’s too low will be instantly damaged if it’s installed in a fixture with a higher voltage requirement. Line Voltage: This is the standard voltage that’s found in outlets and junction boxes. They don’t require a transformer, making them more cost-effective. Low Voltage: With low-voltage options, the transformer is typically built into the fixture or located at another spot. This lighting tends to be warmer, sharper, and more natural. The base of the bulb is the part that is fitted into the light fixture. Each base has a corresponding number that measures its diameter in millimeters. Make sure to check your current bulb to see what size it is, or use measuring tape to measure the width. Screw Bases: The most common type, screw-base bulbs are also referred to as Edison bulbs. They are designed to be quickly twisted into place and come in a variety of different sizes. Popular options include candelabras (for decorative appliances like chandeliers and night lights) and E26 bulbs (used in standard light fixtures). Pin Bases: You’ll often see pin-based bulbs used in smaller appliances or those that require fluorescent lighting. They feature two pins that stick out of the base and connect the bulb to the voltage. Pin base names include a number that measures the distance in millimeters from the center point of the base to each pin. 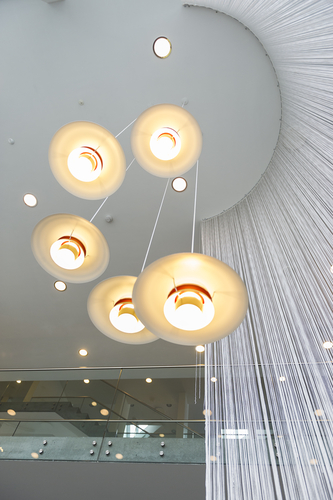 A light fixture’s wattage refers to the amount of energy it uses. This rating is often printed on the inside of your lamp’s socket. A low-wattage light bulb produces less light, while high-wattage bulbs will be brighter. Never install a bulb with a wattage that exceeds your light fixture’s recommended maximum. A too-high bulb runs the risk of getting too hot and melting the surrounding material, including the wiring. Even a 60-watt bulb installed in a lamp with a maximum rating of 50 could potentially start a fire. With residential lighting showrooms in Lexington, Georgetown, and Frankfort, the industry experts at Kentucky Lighting & Supply boast more than 50 years of experience in the electrical supply industry. Head online or call (859) 259-0466 today to learn more about their residential, industrial, and commercial light fixtures and other products.